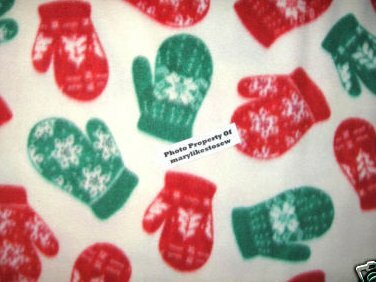 Fleece Fabric blanket Red Green Mittens New soft 45X60"
Depicts red and green mittens decorated with snowflakes. The mittens are about 6" long. This is the prettiest soft fleece fabric blanket for your favorite child. Measures approximately 45" X 60". Single thickness. Great size for a child or adult to cuddle in. So soft and comfy!